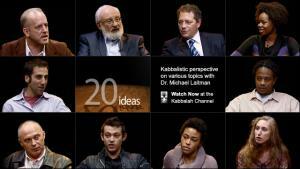 20 Ideas features Dr. Michael Laitman in conversation with guests from a wide variety of backgrounds and professions on problems they experience in their area of expertise, and in their lives. Did you ever think that there could be just one cause to all problems in yours and everybody’s lives? By seeing examples of Kabbalah’s ability to unfold any problem, and view the problem inclusively at personal, social and global scales, you get to see how Kabbalah diagnoses any problem’s cause at a single source: the constantly growing ego residing in every person’s nature. This kind of analysis takes place time and again in 20 Ideas on the premise that by correctly diagnosing the cause of your problems, you already have half the cure in your hand. 20 Ideas invites you to increase your self-awareness, and your awareness of others and nature, from a vantage point where they all interconnect. Each conversation acts as an example of how, with a deep understanding of nature’s structure and functioning, you can approach all kinds of circumstances in day-to-day life with harmony and balance. By increasing your awareness of how nature operates on you at every moment, you’re already making positive changes for yourself and for others. This is known that money makes us disembarrass. But how to act if someone doesn't have cash? The only one way is to try to get the personal loans or student loan. Some specialists argue that credit loans aid a lot of people to live their own way, just because they are able to feel free to buy needed goods. Furthermore, a lot of banks offer consolidation loan for different persons. Please, do send this content to my e-mail since it will not be shown publicly. As you are sending this to my e-mail, may it please you to allow me to preview it here. Like the epispde about soulmates, I know from experience that having a good relationship is very much about transcending your ego, making concessions.